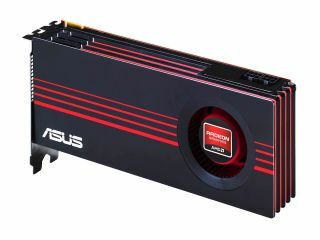 Asus has announced its EAH6800 Series graphics cards, using AMD's latest technology. AMD's latest Radeon HD cards have now been announced, and Asus is hoping that its additions to the reference card – like Voltage Tweak – will mark it out in the market. "Featuring even more processing power than the successful EAH5000 Series of graphics cards, the new ASUS EAH6800 Series continues to serve PC enthusiasts with cutting-edge technology and a range of exclusive performance-boosting improvements to the AMD reference design," said Asus. "Both the EAH6850 DirectCU/2DIS/1GD5 and EAH6870/2DI2S/1GD5 cards feature AMD Eyefinity multi-display technology, AMD HD3D technology and DirectX 11 support," the company added. "In addition, exclusive Voltage Tweak overclocking technology offers a 50 per cent performance boost over the reference design. "The EAH6850 DirectCU and EAH6870 also ship with factory overclocked cores set to 790MHz and 913MHz." The EAH6850 DirectCU is apparently factory overclocked to perform at 790MHz a 15MHz increase on the stock performance, and copper heat pipes are also, Asus claims, a significant enhancement on the reference design.